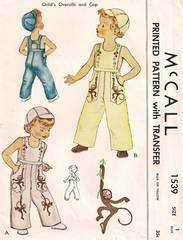 Overalls with side pocket pockets and buttoned back "H" strap. Unused transfer for monkey applique is included. Cap has six section crown and peak. Childs Size 1; Chest 20; Waist 19. Pattern is complete. Hat pieces are cut; overall pieces are uncut. Envelope is in very good condition.